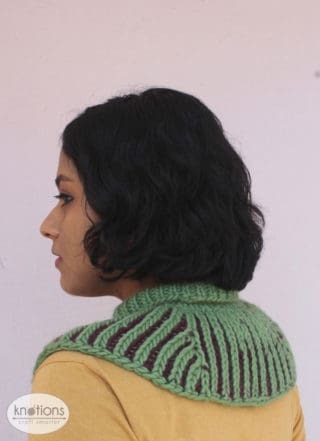 If you love the look of two-color brioche but are intimidated by brks and brps, this design is for you! 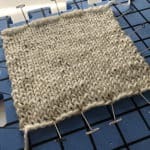 It applies the easier technique of “knit below” to obtain brioche fabric with very little effort. No previous experience with brioche knitting is needed. 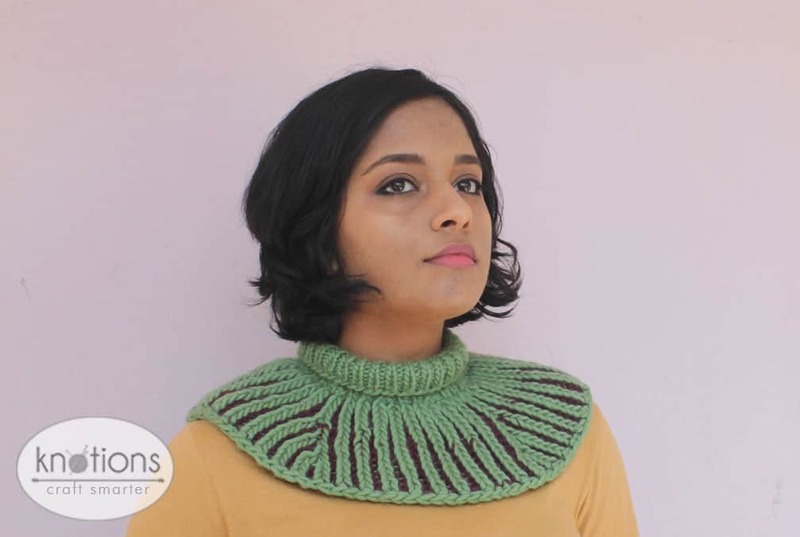 The cowl is worked seamlessly in the round and is reversible. 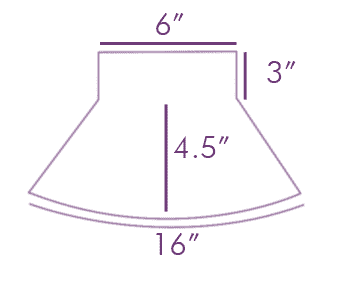 Top-down construction allows size adjustment for a perfect fit and the added option of working a capelet version. The placement of the decorative double increases produces a different appearance of the cowl front when the cowl is given a quarter-turn. The spreading ribs on the cowl bring to mind a colorful sea anemone clinging to a rock under the ocean. Size can be adjusted up or down to fit. See below. Valley Yarns Berkshire bulky (85% wool, 15% alpaca; 108 yards [98.8 meters]/100 grams); MC Mistletoe (37), CC Plum (20); one skein each. Actual usage: MC 78 gm, CC 43 gm. We thank Webs for their generous yarn support for this design! Check out their Valley Yarns Berkshire Bulky. Size US 2 (3 mm) and US 6 (4 mm) 40” or longer circular needles for magic loop technique (or dpn’s and 32” circular needles if preferred). US 8 (5 mm) 32” circular needle for BO. Optional: 3 mm and 5 mm crochet hooks (for CO and a neat finish to BO, respectively). Stitch markers; tapestry needle; waste yarn (for lifelines). Approx 18 sts and 17 rounds = 4” [10 cm] in 1×1 rib with smaller needle. Approx 12 sts and 24 rounds = 4” [10 cm] in body pattern worked even ((alternately working rnds 1 & 2 only) with larger needle. Note: Since this is a ribbed pattern, there will be no significant change in gauge after blocking. Brioche fabric is typically worked on smaller needles than would be usually used for a given yarn thickness. k1b – knit the stitch one row below the next stitch on the left needle (below the stitch you would usually knit). Once you knit this stitch in the row below, drop the stitch on the left needle (the one you would have usually knitted) off the needle. p1b – purl the stitch one row below the next stitch on the left needle (below the stitch you would usually purl). Once you purl this stitch in the row below, drop the stitch on the left needle (the one you would have usually purled) off the needle. With smaller needle and a stretchy cast-on technique, CO 60 st in MC and join into a ring taking care not to twist stitches. This design used the Chinese Waitress CO with a 3 mm crochet hook. Pm for first st.
Rnds 1 to 14: Work 1×1 ribbing (p1, k1) around (approx 3” from CO edge). Pm into every 6th stitch on the last rnd. Rnd 15: With larger needle, *(p1, k1) twice, p1, (k, k tbl, k) into next (marked) st. Rep from * nine more times till end of rnd – 80 sts. Setup rnd: With larger needle and MC, (p1, k1) around. Pm for first st of rnd. Odd-numbered rounds are worked in CC as (p1b, k1) around and even-numbered rounds in MC as (p1, k1b) around. Avoid twisting the yarns when picking up a new color for the next rnd. Note that you should always be working into a round of the other color, and that all incr are always worked into a knit st.
Rnds 1, 3, 5 & 7: With CC, (p1b, k1) around. Rnds 2, 4, 6 & 8: With MC, (p1, k1b) around. Pm in every 20th st on rnd 8. Rnd 9 (first incr rnd): With CC, *(p1b, k1) nine times, p1b, (k,yo,k) (centred double incr) into next (marked) st. Rep from * three times – 88 sts. Pm anywhere on the body between the first and second incr to indicate the front of the cowl. Centered double incr 1 & 2 will thus be on the front of the cowl and centered double incr 3 & 4 will be on the back of the cowl. Place 4 markers (of a different color from the previous marker) on the increase rnd, on the outermost sts of each of the four centered double incr. Seen from the direction of work, the markers will thus be placed on the right-most st for centered double incr 1 & 3 and the left-most st for centered double incr 2 & 4 (sts 20, 44, 64 and 88). These markers indicate the vertical lines along which the next centred double incr will be worked on the next incr rnd. Rnd 10 (and all rnds following an incr rnd): With MC, follow pattern for even rounds, working k1b, p1, k1b into the k, yo, k respectively of the incr round (see tip). Rnds 11 & 12: follow pattern for odd and even rounds. Rnd 13 (second incr rnd): Pm on sts 20, 44, 64 and 88 (which lie in the same vertical lines as the marked sts on the previous incr rnd 9). With CC, work *(p1b, k1) around, working (k,yo,k) (centred double incr) into marked sts – 96 sts. Pm on the right-most st for centred double incr 1 & 3 and the left-most st for centred double incr 2 & 4 (stitches 20, 48, 68 and 96). Rnd 14: Same as rnd 10. Rnds 15 to 18: follow pattern for odd and even rounds. Rnd 19 (third and final incr rnd): Pm on sts 20, 48, 68 and 96 (which lie in the same vertical lines as the marked sts on the previous incr rnd 13). With CC, work *(p1b, k1) around, working (k,yo,k) (centred double incr) into marked sts – 104 sts. Rnd 20: Same as rnd 10. Rnds 21 to 28: Follow pattern for odd and even rounds. With 5 mm circular needle, BO in p1, k1 rib using Jeny’s surprisingly stretchy BO. (Optional: For a neat finish, after the last st of BO, use a 5 mm crochet hook to ch 1, then work a sl st under both chain loops of the first BO st of the rnd). Cut yarn and pull through loop on hook. Neaten the stitches (see tip). Wet block without stretching the fabric. For a neat reversible look, weave in the ends in the purl trough between two knit rib columns (on the WS for MC, amd on the RS for CC). For MC, thread the yarn needle with the yarn tail, and pass it through to the WS. Next, working on one side of the purl trough (either right or left), pass the needle upwards through 4 or 5 horizontal sts of the same color and pull yarn through. Then cross the needle across to the other side of the purl trough and pass it downwards through 4 or 5 horizontal sts of the same color on the other side, pull yarn through. Stretch the fabric for even tension and clip the end. Repeat the process on the RS for weaving in CC. Mistakes in brioche fabric can be tedious to correct later. Keep a correct rnd count and check each rnd for correctness after it is worked. Use of a lifeline for every incr rnd is recommended; leave enough slack in the line to permit trying on of the cowl. Check for correctness of rnd before moving the lifeline upwards to the next incr round. For ease of working, use the same colored sm(s) along the same rnd. 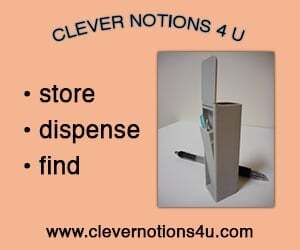 Use a different colored marker for the first st of the rnd, and move it upwards along the rnds from time to time. To work into the st below, it is usually easier to feel (rather than see) the space to be worked into between the left thumb and index finger. On the rnd following an incr rnd, p1b is easier to work into if the space to be worked into is first felt, and then opened from behind with the tip of the right needle. On the rnd following an incr rnd, when k1b, p1, k1b is worked into the incr group below (k, yo, k), the k1b’s are worked into the same space. 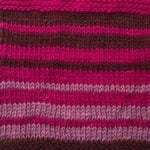 Neatening the rib lines: gently pull apart the two purl troughs on either side of a knitted rib line. The knit rib will move into the correct position. Correcting mistakes: First, transfer the sts on one side of the mistake to a spare circular needle. Then carefully drop down stitches along a knit column to the level of the mistake (RS for MC and WS for CC). 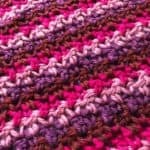 Undo the wrong st. Insert a crochet hook through the correct knit st below the mistake. This should leave you with a ladder of alternating color rungs (CC rung nearest to hook on RS and MC rung nearest to hook on WS). Pass the hook underneath the nearest 2 rungs above it (the lower rung of the color opposite to that on hook, and the upper rung of the same color as that on hook). Hook the upper rung (same color) and pull through the st on hook. Continue upwards in the same manner, finishing with a st of MC on hook if the round on the needles is in MC. 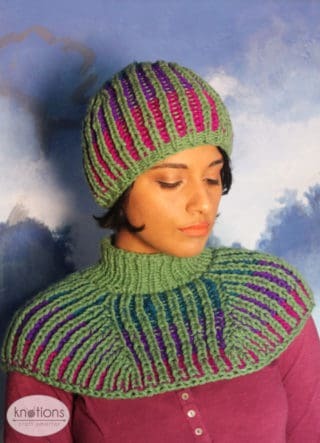 If the round on the needles is in CC, the uppermost rung will be CC; draw the CC rung through the MC st on hook as instructed above to complete the column. Slip the last st of the corrected column back onto needle and continue the work. Since the construction is top-down, any smaller or larger size can be achieved (see below). 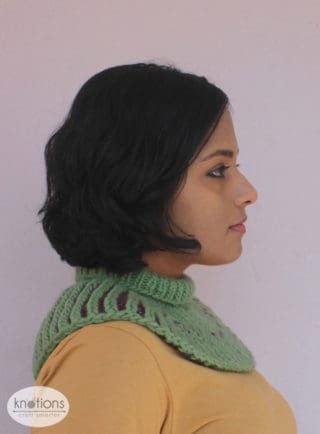 For a larger cowl: Try the cowl on after every two incr rounds. If a bigger cowl is needed, incr 8 st in rnd 25, and continue placing incr rounds every sixth round as needed. Work the last incr rnd 1.5” before the desired lower edge, and work the last 9 rounds even. Incr 8 st in rnd 25, and continue placing incr rounds every sixth round until the lower edge has covered the shoulders to the desired length. Work the last incr rnd 1.5” before the desired lower edge, and work the last 9 rounds even. Keep in mind that you will need more yarn; the capelet shown measures 6” (15 cm) height x 36″ (91.5 cm) circumference at lower end and used about 80 gm of each color. 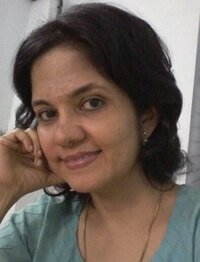 Padma’s adventures with ribbing began with a hat for a teenage nephew -the stretchy brioche texture left her smitten! 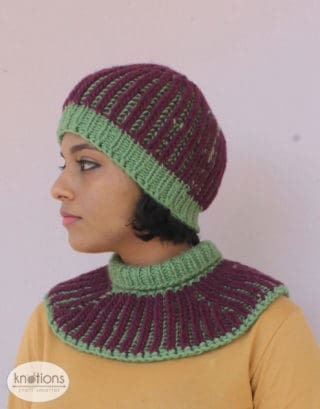 One day, while trying on the brim for size, it slipped down around her neck, and the idea for a cowl was born. Next, her interest shifted to two-color brioche and adjustable sizing. Not finding any methods for increasing in two-color Fisherman’s rib, she set about experimenting to find her own. 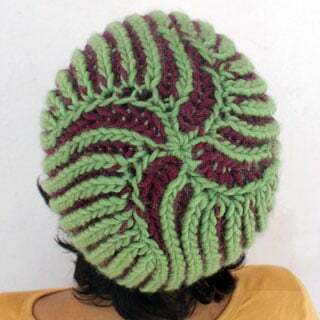 The results are incorporated in this design and its companion Unbrioched Hat. She finds it exciting that sometimes, results produced with a supposedly complex technique can be achieved in a much simpler way.